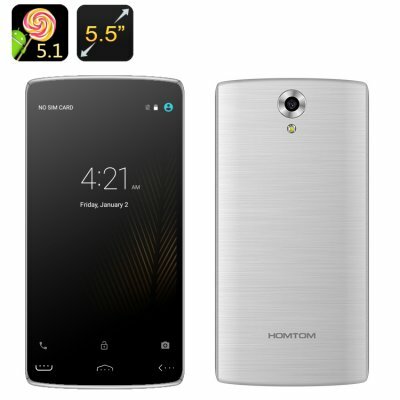 Successfully Added HOMTOM HT7 Pro Smartphone - 5.5 Inch HD Screen, 4G, Dual SIM, Quad Core CPU, Bluetooth 4.0 (Silver) to your Shopping Cart. The HOMTOM HT7 Pro smartphone come with 2 SIM cads supporting 4G, a powerful quad core processor, Smart Wake, Android 5.1 and more. The HOMTOM HT7 Pro comes with Android 5.1 operating system and will let you enjoy unlimited Play Store access, 16GB of internal memory and up to 128GB on an SD card to store all your media, apps and games. Plus, you will have a 5.5 inch HD screen at your service. You will have 2 SIM cards supporting 4G – and, thus, amazingly fast web browsing speeds, downloads, social media fun and more. A cool extra is the support of Smart Wake – a navigation shortcut that lets you access a set of selected apps from the locked screen: simply draw a “C” on the locked screen for camera, “e” for browser and so on – you get the idea. The HOMTOM HT7 Pro comes with Bluetooth 4.0 and will give you smooth connectivity with other Bluetooth devices: headsets, smartwatches and more. With the 3000Mah battery, you get up to 200 hours on standby and 12 hours of non-stop talk time. The quad core CPU will ensure smooth operation and the Mali-T720 will take care of your gaming needs. The HOMTOM HT7 Pro Smartphone comes with a 12 months warranty, brought to you by the leader in electronic devices as well as wholesale Android Phones..